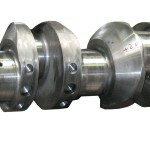 Crank Shafts | Product Categories | Rhine Exports Pvt. Ltd. Dealing with all marine diesel and gas engine crankshaft’s, of all models including Main Engine, Auxiliary, Compressor, etc,.